Fifty-seven million Americans say they’d join a union if they had a chance. And due to a hard-fought, close to the ground campaign, legislation to give them that right is now within striking distance of victory. Going against the tide and all conventional wisdom in a Republican-dominated Congress, the Employee Free Choice Act, HR 1696, first introduced in November 2003, now is just two representatives shy of an outright majority in the U.S. House of Representatives with 215 co-sponsors in addition to its sponsor Rep. George Miller (D-Calif.). In the Senate, as S 842, it has 43 supporters. To put the campaign over the top, representatives from 20 AFL-CIO unions gathered in Washington June 6 to map out a plan to deploy a massive army of workplace shop stewards, according to Stuart Acuff, organizing director of the federation. The centerpiece of the EFCA is a streamlined process for workers to attain union recognition. Using a “card check” procedure, workers gather signatures of a majority of their co-workers on union authorization cards, the National Labor Relations Board certifies the signatures, and bargaining for a first contract begins. Current law allows employers to insist on an additional stage — an election and a drawn out campaign leading up to it. While an election sounds democratic, the realities of the U.S. workplace turn this employer option into a coercive tool according to American Rights at Work. A boss can not only fire you and deprive you of your livelihood, he can make your life at work a living hell. Even if 100 percent of workers sign cards, under the present law, the employer can still insist on an election. Since the Reagan administration assault on air traffic controllers opened the floodgates on union busting in 1981, U.S. employers have been using the election option to drag out the certification process for years. The stalling pays off for the employer: every day of delay in holding the union election results in a .29 percent loss of union support, according to a study by Paul Weiler that appeared in the Harvard Law Review. Meanwhile, workers are threatened with images of violent strikes and plant shutdowns during “captive audience” meetings. In more than half of organizing campaigns involving immigrants, management threatens to call in the immigration authorities. On top of that, at least one-quarter of employers illegally fire union activists. 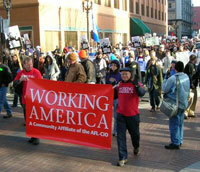 A recent poll showed 79 percent of workers believe that a worker is likely to be fired for trying to organize a union. Thirty-six percent of employees who voted no said they did so as a result of their boss’s pressure. “We’re telling the story,” says Acuff, “and whenever someone knows what the truth is, they’re outraged.” Today, in nearly every ongoing organizing effort, the union is exposing the employers’ underhanded anti-union campaign to the public, Acuff said. He cited the example of Comcast, the nation’s largest cable provider, where public hearings and demonstrations across the nation have exposed the company’s illegal firings and refusal to bargain. “We are engaged in nearly 10 national or regional campaigns where this is an issue,” he said, adding that almost every union in the AFL-CIO has done something on it. The Steelworkers have made EFCA their legislative priority, Acuff said. He pointed to that union’s Rapid Response team as a model for what the proposed stewards network could do: mobilizing at work to make phone calls and visits to individual representatives. Last year, grassroots activists turned out 60,000 supporters on Dec. 10, International Human Rights Day, demanding the right to organize for American workers. The EFCA also contains provisions mandating mediation and binding arbitration to get a first contract after union recognition. With virtually no penalty for failing to bargain in good faith, employers currently wear down union support even when union supporters do win an election. On the south side of Chicago, after cable installers and customer service reps voted in the IBEW, Comcast dragged out contract negotiations for five years to turn the workers against the union. The act also substantially stiffens penalties for violating labor law.